Would you like to do the shopping for you! Just tell us what you need! Fresh provisions are of particular importance especially when you are cruising around secluded islands and beaches. You just let us know what your personal preferences are and we will make sure you have everything onboard! Need of any transportation service from to the airport or any other place you want to visit? Would you like to sail with a group of other sailors and join a flotilla? Ask us for available dates! Enjoy the feeling of freedom and the safety of support every day on Flotilla! 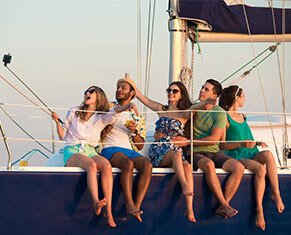 Mix with other yachts, meet and share stories with like-minded sailors or just go your own way. It's your choice! One transfer from the airport to the marina of Lefkas or Athens(Alimos) and vice versa per yacht. To sail a yacht in a flotilla you need to have skippered a sailing or cruising yacht previously in a flotilla or bareboat.